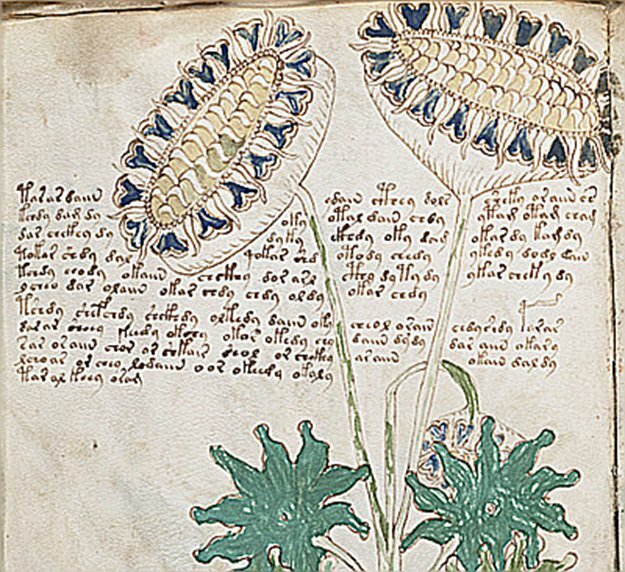 This section of the website looks at my research into the fascinating Voynich manuscript, the 15th century document which has as yet been completely undeciphered. Click on the menu above to find a paper on a partial decoding of the script, as well as a video showing informally what I am trying to do. i love this manuscript and i am really fascinated by your work! People like Jutta Kellner (see above) only want money i suppose. As i read her website, i was basically wondered what people can imagine just by seeing an Latin-like Letter at the begin of a in unknown language written word. What is your personal opinion about the idea that the Voynich manuscript is may be based on an AZTEC-Language, coming from Mexico? 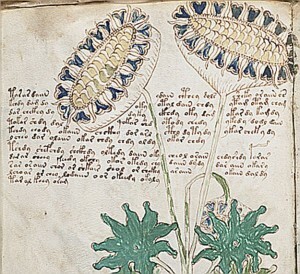 That would also describe how the sunflower-like plant got illustrated in the manuscript! Hi Tim. Personally I think it highly unlikely. For one thing there are many reasons for considering that the manuscript comes from Europe or the Near East (see discussion here) . Secondly, some plants which have been identified with some certainty, such as Ricinus Communis were not known in the Americas until very late. Thirdly, scholars of Aztec and Mayan languages have all reported that they can see nothing resembling those languages in the VM. Fourthly, the sunflower could be a lot of other plants, and is not now thought to be a sunflower. See Stolfi’s discussion here. So, all in all, I think the evidence is against it! I believe you! When I first saw a small bit of this and scrolled through the images online, I couldn’t help but cackle! Its brilliant! I myself, feel inspired to do something similar with my writings and drawings. Why couldn’t the people’s of yore have their jests and “pranks”: their revealings of universal truth in such context that modern man feels he invented!! As if “this” society were the only one in whole world history to think critically about ridiculous cultural norms using wit and humor! This generation is backwards and arrogant, with no wisdom in it. I look forward to reading more of your translations as this deeply fascinates me. Thank you! The Voynich Manuscript is solved by myself since 2007. It is written in Latin! And I have translated many pages and not only some words. You floated a suggestion in the room wich is no longer tenable. There is no one who would use several languages ​​in order to create such a work like this. Sorry, but your approach of translation is trivial and completely wrong. Even if you carry on, then you will never find meaningful, coherent texts by using linguistic tricks as before. This inventors were foxier than you believe. Thanks for this – would you be able to provide a transcription and translation for page f2r, the page with the plant which seems to be the Centaury? I would be very interested to see them – at least for the first paragraph, if possible. On my homepage you can get translated extracts of the pages 25r, 27r, 28r and 28v. Also I explain there why I do not publish my code. A shorter summary of my published results is now available as a video in German and English. But now I give you an answer of your question. First I want to clarify something. You are following exactly the intention of the inventors. You see a plant, so it must be a plant! To some extent this is true, but it is hidden knowledge. Never result of obviousness. In this manuscript, a lot more puzzles are hidden as you can see at first glance. And never think that in addition to what you see the explanation is beside it! I explained on my side, that the plants represent a calendar. The events on page f2r happened on date 13th March 1248. -This story relates to the Assassins in the Holy Land and their doings. “The Old Man of the Mountain” Only by the invasion of the Mongols in 1256, they were wiped out. – It tells a story of everyday life. By the way, these inventors have not made big mistakes when they have written down this text. Thank you. However, you will understand that if you do not publish your code and do not explain your translation, people will not believe you. Could you give us the first lines of page 2r in Latin, as you have transcribed it, showing how you get from the Voynich script to Latin, to English? Also how do you explain the carbon date of +- 1430? It seems to me you have not even bothered to read my web pages. It may be that no one want to believe me at the moment, if I do not give out my code. People who know me know, that I only give something to the outside what I can prove. Imagine you would find at the present time the grave of Tut Ench Amun and seek sponsors for the archaeological work and they would say to you: Tell us once where the grave is and then we will test and consider whether we can help you. Would you do that? But in the meantime, this “inspectors” would try to acquire this knowledge in order to stand even shiny. My knowledge is my capital, just as the 6 years of hard work that have already been invested. Do you believe in all seriousness I would simply publish it, so that all can fall on it like hyenas? I no longer believe in the loyalty and fairness of most others. Also, it is not yet the time, because I’m not finished with the translation. With the partial publication of the translation of 28r I presented four contiguous rows. And with the beginnings of the paragraphs of page 2r you may even have noticed what irony contained in the words. With a few words they come straight to the point. The whole manuscript is fascinating written and interspersed with wit and irony. At one point they complain for example about the knights of Europe which comes to the Holy Land to play war again. Or it is told from the whore who follows her punter into the battle. Already on my homepage, I explained that the time of origin of the parchment has not surprised me. At the beginning of the 15th century were written down texts from their former past. I said before that this manuscript is a work of generations. Those who want to support me financially would be receiving more insights into my work! All others have to wait until my work is finished and the book is published. I somehow believe you didn’t solve it. You can believe it or not. I’m telling the truth and the future will prove it when the translation is published as a book. When will the book be out, is there a publication date yet? I’ve always found this manuscript fascinating to even browse through despite not understanding the content. I’m listening to your talk regarding the translation and so far it’s fascinating. I came to the part regarding Black Cumin and I have some input regarding your theory about the name in Hindi. I’m Bangla speaking but I understand Hindi pretty well – thanks to being next door neighbor and similar roots. I do understand that Jeera is the Bangla and Hindi for Cumin and by no means Jeera stands for seeds. That’s because, we’re quite familiar with such seed like spices and besides cumin we have a few more widely used similar spices that looks almost the same. For this reason, each of these seed like spices have been given completely different names – regardless of their resemblance with seeds. So “Jeera” is a unique name given to this spice called Cumin and so Black Cumin is Kalo(Bangla)/Kala(Hindi) Jeera. Wishing you all the best Sir! I’ve always found this manuscript, and the mystery surrounding it, fascinating. With some of the plants at least tentatively identified, I wonder if another route to look for key words might be plant characteristics? After watching your video and getting a bit inspired, I’ve started going through the more toxic plants in the proposed lists I’ve seen, looking for words that are common to the majority of them. I’ll then run them through what appear to be the least toxic plants, and see which words appear in the first group but not the latter. I’m hoping the list will be relatively small, and an expert may be able to see if any of them may have roots in the languages you suggest for something along the lines of “death”, “poison”, “toxic”, “caution”, etc. That sounds a good idea in principle- you will find that the whole text has been transcribed and is available for analysis (see voynich.nu for details). The problem will be: which language will you look in? To be honest, we are still in the dark about the language to look for, but I hope we can all make some progress soon. I just watched your video today and I must say I found it incredibly interesting. One thing that came to mind though is that, in Hindi, (and I know this from watching numerous Indian cooking videos) the seeds of nigella sativa are most often referred to as “kalonji”. Black cumin actually refers to a different spice – Bunium bulbocastanum. It is called “kala jeera”, meaning “black cumin” or alternately “shahi jeera”, meaning “imperial cumin”. And that makes sense because it looks and tastes somewhat similar to cumin and the two are related more closely than either is to nigella sativa. I’m not sure how this might change your reading, but I’m looking forward to a more complete understanding of this very intriguing manuscript. Thanks – in the full paper, which you can find on this site, I discuss the apparent confusion or mixing of the names for Black Cumin and Nigella Sativa. You are right that they are often confused, and always have been! Saw your video today, thanks for posting your fascinating research which seems to be the first to give a foothold for more. I’m sure more linguists will join you and will bring you insights of their own. Thank you for sharing your exceptional work with the world. Thank you! This is fascinating. Thank you, Dr. Bax. I believe that this is a Turkic text. Let me start with “Coriander”. The VM reading is KOORATU, which sounds like a variant of “KOR OTU”, meaning “the kor plant” or “the herb Kor”. The word “Coreandrum Sativum” being quite a tongue twister, must have been simplified. This would also explain the ending “ATU” being repeated throughout the manuscript with various suffixes, which are prepositions. e.g. Turkish: OTUN, OTA, OTLA, OTTA, OTTAN… With the plant, of the plant, etc. The next plant in the VM is “Centaurea” or KNT/ə/IR CH/ə/UR. I think “Chiron” is too much of a stretch for the second word, which actually sounds like the old Turkish word “çöğür”, which gives us “The Thistle of Centaur”. The word “çöğür” is still used in parts of Anatolia for flowering plants with thorns or bushes today (and a musical instrument with a long neck probably because of its shape). In the case of Nigella Sativa, which reads as KA/ə/UR CHAR, the modern Turkish name is “kara çörek otu” or simply “Çöreotu”. The word KA/ə/UR must mean “black” (not “Hellebore” as suggested). That’s why we see the same word in the VM describing both, the black Hellebore, AND black cumin. CHAR-çöre connection is clear, KAUR-kara is a little less so. I believe this word is related to KAVUR, which means “to roast” in modern Turkish, however was used for “blacken” in old Turkish texts. Words like kavruk, kauruk and kuurul are still used in some Turkic languages for “blackened”. Bravo Mr. Bax! As a Director of a Dual Language Program in California, I applaud your tenacity and your humility in your wonderful video presentation that I just viewed. Your ability to synthesize all the disciplines of linguistics, science, astronomy, etc, proves you are decoding this manuscript by viewing it through many lenses. I cannot believe the arrogance of those who called it a hoax due to their failures to decipher the manuscript. Egos aside, I look forward to your collaboration with others in all the disciplines that will reveal the manuscript to us lay people. Hello, Stephen! Not-so-long-no-see? Just a short note b4 I attempt to watch your video. I have a rather crotchety & elderly computer/printer system which I tend to coddle. Even then, I usually can’t follow spoken dialogue which accompany videos UNLESS I can see the speaker’s face and mouth or UNLESS captioning is available. So, I shall now return to the recent video presentation; but only after I am reassured that my note, herein, has been accepted by you. Arabic? Two codices you might want to see: Codex florentino 519.jpg (“Romanized” Nahuatl words) and “Classical Nahuatl language” — a Wikipedia offering which identifies Classical Nahuatl as being a “Uto-Aztecan language of the Nahuan or Aztecan language.” The second Wikipedia” offering has been most helpful to me in translating whole phrases which also appear in the Vms: “File:Codex florentino 51 9.jpg” (Quote marks are mine but the reference within the quote marks is exact.) Hope this goes thru — fingers crossed on one hand only! Congrats! Now that you’ve made the first dent, more discoveries will follow ! “Kara” (or Khara”) is also “Black” in classical Mongolian. It is exciting! I think, author of ”Voynich Manuscript” knew the prime numbers. Also knew Claudius Ptolemaeus’ s works. I watched your video and am really excited about your conclusions. One thing that occurred to me, the last plant that you looked at in the video (“coodon”?) and thought could be cotton might actually be a cardoon instead. It looks similar, and the cardoon was popular in early and medieval Persian cuisine. Thanks – interesting. I’m not too convinced about ‘cotton’, but I am investigating the idea of ‘flax’ which has a similar name in some languages. I’ll look out for cardoon as well – thanks for the tip. It could be a discarded script for a language written somewhere else in another alphabet. I just saw the video and shall read the full article tomorrow. This has increased my happiness today! Just a comment some may have already put forward about your guess that the script may be the notation of an extinguished language. Languages change scripts when more people read a new script more easily. Sanskrit is written in Devanagari but also in Bengali script etc. Thank you for sharing the joy of discovery! I really enjoyed watching the video, and the paper was fantastic, as well. I had always been a bit curious as to why people hadn’t used the Rosetta method for the Voynich, but had settled on the explanation that it was just too insanely difficult to pick them out without a clear reference. Fascinating work, and thank you. Exceptional work. Thank you for sharing with the masses. I have learn several excellent stuff here. Certainly worth bookmarking for revisiting. I wonder how much effort you set to make this sort of magnificent informative web site.